SNAFU! : HIMARS launch from the deck of an amphib? 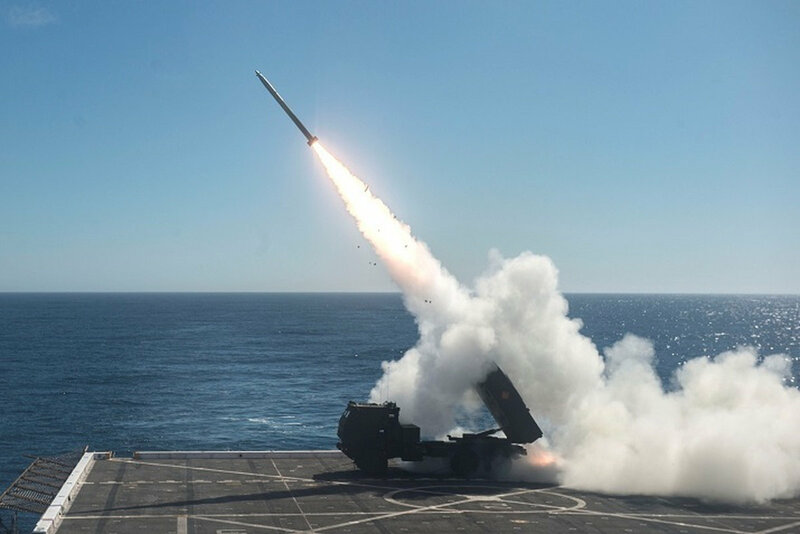 HIMARS launch from the deck of an amphib? I'm sure you guys have already chopped this up (and if you haven't then follow the link). Well done. This has been talked about as far back as Mike Sparks on his blog and New Wars blog also pounded on the table about doing exactly what we're seeing. What I'd like to see is a more robust test/experimentation with the concept. I'd love to see 8 HIMARS (just a round number...could be more if they can be accommodated) strapped to the flight deck of a Mobile Landing Platform (MLP) and they conduct a "grid square eradication exercise"! Then I'd love to see some type of reload conducted. If you have 8 HIMARS up then is there enough room to have 8 more drive up, get strapped down and await the next fire mission while the original vehicles are reloaded. Is there room for such a thing? Does it make sense? Can we do this with the same number of vehicles but instead of MLRS rockets we use ATACMS instead? Does it makes sense to perhaps use podded Tomahawks or ground launched JASSMs in this role too? This was a good start but I'd like to unleash the innovation in the Marine Corps to its full. Baby steps lead to walking then running. I know that but we've got to get bold in our experimentation. If it fails then oh well but at least we tried!